It also broke the lowest temperature it has seen in November. The old record was minus 20 (minus 28 Celsius) on Nov. 30, 1958. Why are nations suddenly getting so concerned? He is doing nothing unusual for a climatocrat. A present from the ‘rapidly warming’ Arctic? 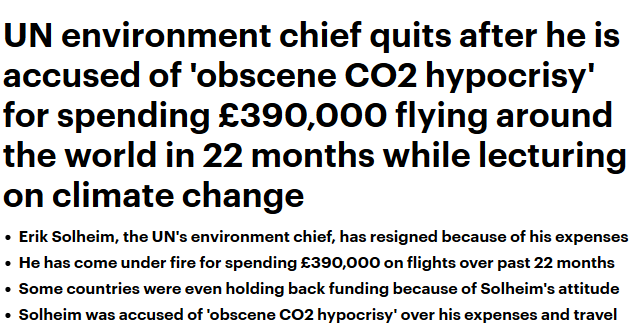 Now if we could cull all the UN climate change departments and charge those in charge with fraud we might get somewhere. As it stands all this does is placate a few people to get the money tap turned on again. On the face of it, I don’t care. I had a job 30 years ago that required me to travel extensively. For all I know, travel may have been an important part of Solheim’s job. He didn’t create the irony having to travel to get people to stop traveling. That sounds like a bit more than just travelling to the next lecture venue. Over £4,000 a week. I assume he went first class. I didn’t.